Because of my job, I often get to attend events that feature cool authors. On Saturday, that meant Newbery Medal winner Kwame Alexander. Now, getting to meet an author who wrote a book as powerful as The Crossover would make for a good day no matter what. 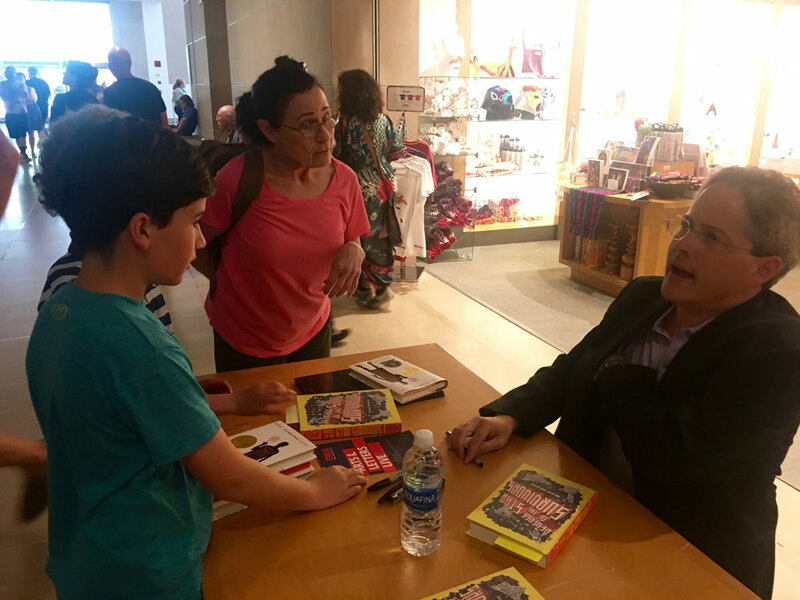 But the people at the Dallas Museum of Art, where I interviewed him onstage, made it doubly nice by displaying my book on a table right next to his. This is where I have to step back and say that the word “Newbery” has sort of a spiritual quality to me. My grade-school library had a poster that listed all the winners; I checked out and read and re-read every one of them I could get my hands on. You know how Clark in Revenge of the Star Survivors feels about people associated with Star Wars? This is how I feel about people associated with the Newbery awards. The first Newbery-related person I met was Adam Gidwitz. He won a Newbery Honor earlier this year. His book The Inquisitor’s Tale amazing -- when I introduced him at another Dallas Museum of Art event, I told the audience how it inspired me to work twice as hard on the revisions to my book, because his is so perfectly crafted. He's since said some very nice things about Revenge of the Star Survivors, and each time that has happened, my head has exploded a little. Kwame Alexander, however, was the first Newbery Medal winner I had met. And I had a good time interviewing him in front of the crowd. 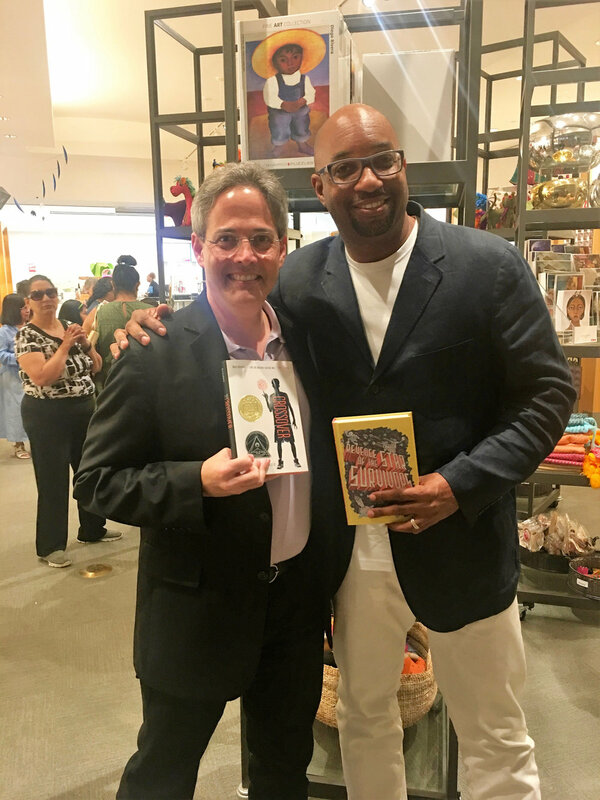 But if the 12-year-old boy in my head was pleased so far, you can imagine how he felt when Kwame Alexander walked over with several copies of Revenge of the Star Survivors for me to sign. Actually, you don’t have to imagine it. I think the goofy look on my face here might say it all. One of the things Kwame Alexander spoke about when he was onstage was his years as a student of the poet Nikki Giovanni. He describes himself as a stubborn, argumentative pupil. But even when he didn’t seem to deserve it, she supported him with acts of kindness that launched his career. Kindness has surrounded me from the moment I started sharing my manuscript. I certainly have not deserved all that I have received. A few of the people who helped me are mentioned in the back in the acknowledgments. Many others have done things, small and large, since the book was published. Most writers I know have similar stories. I'll bet even Nikki Giovanni does. Which – aside from the fact that it gives me an excuse to post a photo of a Newbery winner holding my book – is my point in writing this. To point out that even on our real world, where the headlines are full of truly terrible and scary things, it’s possible to find a chain of good, kind, selfless people that stretches back as far as I can see. It makes me think – this is actually a pretty nice planet to be on.